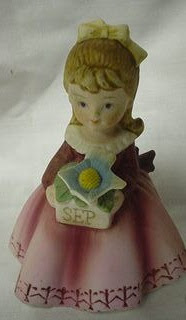 My sister had this figurine for the month she was born. I had one but it wasn't like this. Mine was a glazed, shiny figurine while this one was more of a matte finish. I liked hers better. As you can see in the 2nd photo, some of the petals of the flower are broken off and I think my sister's figurine also had some petals broken off over time. 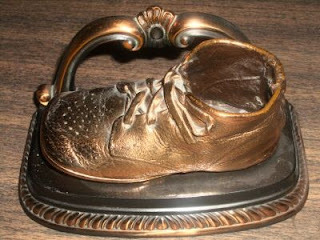 We had bookends just like these. 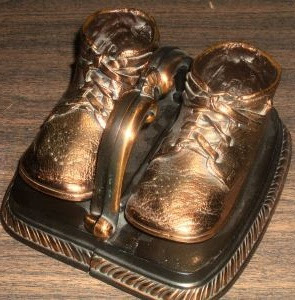 Dad got our baby boots bronzed, I am not sure if he did them himself or sent them away to be done. The bookends were used on our bookcase with our encyclopedias, as you can see in the photo. 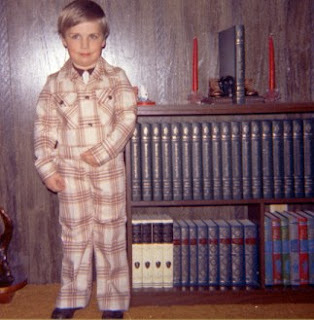 The photo is of my youngest brother on his first day of kindergarten, I think that was 1974. Ah the beautiful fashions of the 70's! 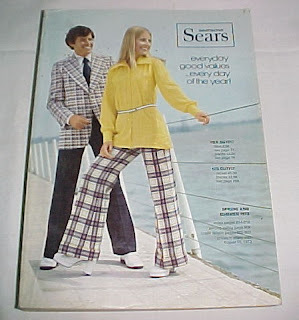 The Sear's catalogue was a popular book in our house. 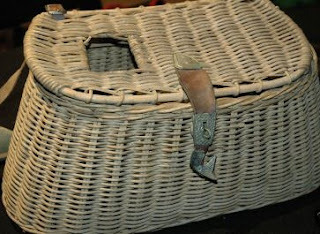 My father owned a wicker creel like this one, as you can see in the photo. 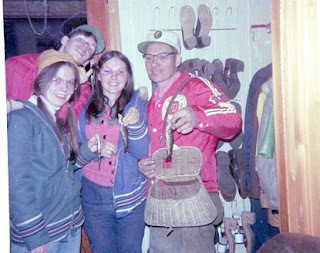 In the photo are my father, older brother and sister. As you can see they did not get very big fish! I guess this photo was taken in the mid 70's. 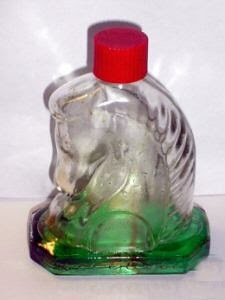 I remember my father or older brother having a bottle of aftershave shaped like a horse's head, like this. 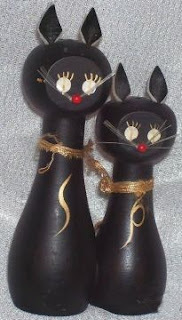 Another cute salt & pepper set from Mom's collection. Another one I forgot about until I saw it in one of our old pictures. I had a paint by number set like this but mine wasn't painted this well. I was never artistic. I'm not sure if they still make these. 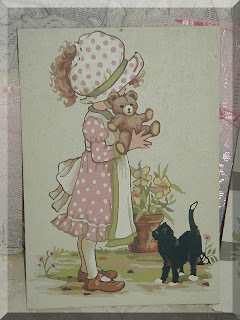 I remember that my oldest sister used one when I was a child. I remember seeing it in the bathroom and thinking that I was going to use one like it when I got older, I thought it was a cute razor. I never did own one though. 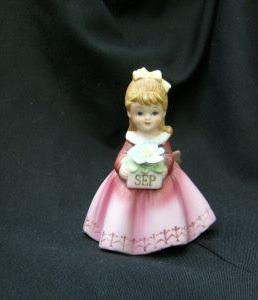 Another salt & pepper set from Mom's collection. 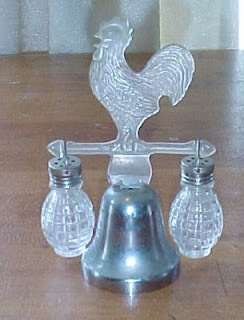 A rooster on a bell with the small glass salt & pepper shakers hanging on the sides. 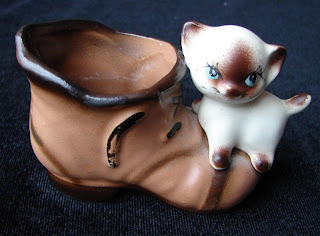 I vaguely remember a figurine like this. Was it a toothpick holder? Not sure, I think my aunt had it. 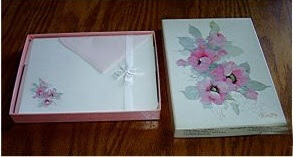 Boxed stationery was a very popular gift when I was a teenager. I wrote to several penpals and friends so it was a gift I enjoyed getting. I had a set just like this. Another salt and pepper set from Mom's collection. 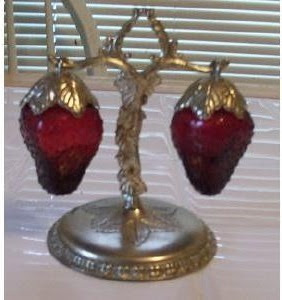 I had forgotten all about them until I saw them on eBay while looking for other things. They looked familiar but I wasn't 100% sure we had them until I saw them in one of our old photos. 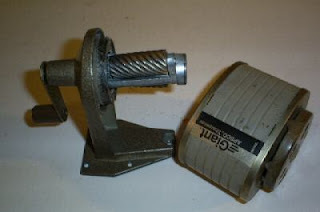 Not only were these a common sight in classrooms when I was growing up, we also had one in our "nook" at home. 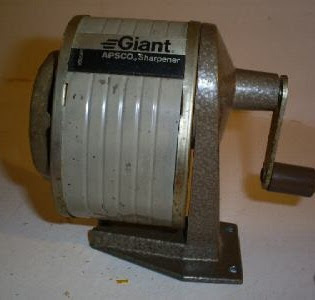 I remember when Dad installed it, I thought it was great, especially since before that I once had the shame of going to school with a pencil that had been sharpened with a paring knife. 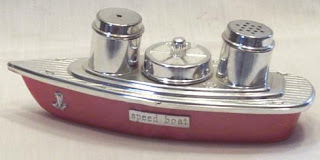 Mom collected salt & pepper sets, I am sure she had a set like this. 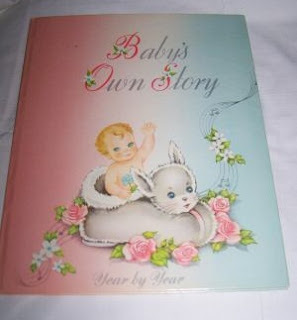 My 2 older sisters, older brother and I had baby books like this. 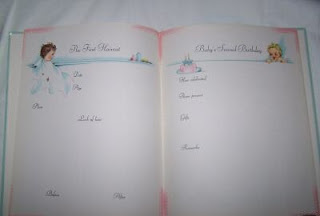 I loved looking through it at what Mom had written in it. She had a lock of my hair from my first haircut, a drawing I had drawn when I was 3 and many photos. We had a lettuce crisper just like this one for our iceberg lettuce (the only lettuce I knew of when I was growing up). It had a spike for the bottom that you would impale your lettuce on to keep it crisp. I guess it worked since we always used it. 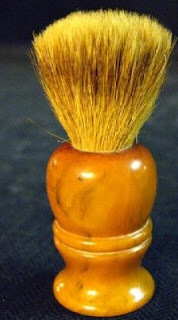 My father had a shaving brush a lot like this one. Do men use shaving brushes these days? 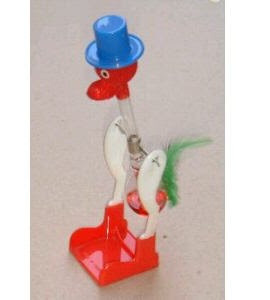 One of my aunts had a drinking bird like this on her kitchen windowsill. I remember being fascinated by it and wondering how it worked. It would bob up and down for ages. 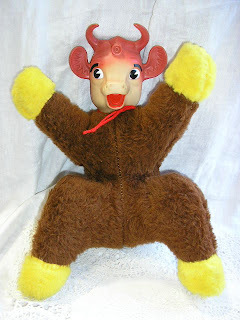 I don't remember this stuffed toy but my older sister does. 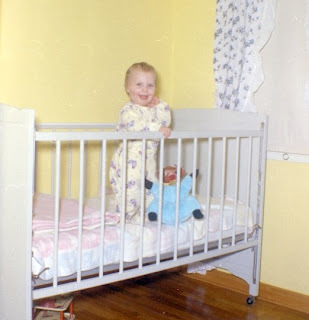 It was hers and you can see it in her crib in the photo. 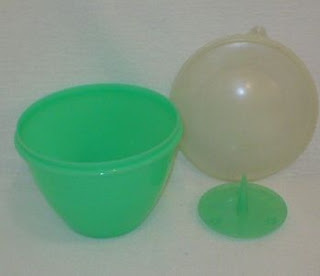 Apparently it came in different colours and the head was plastic. 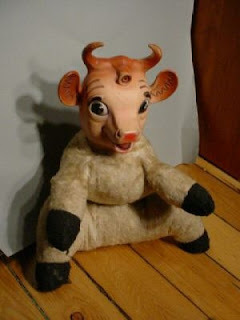 Looks a little creepy to me, sis! 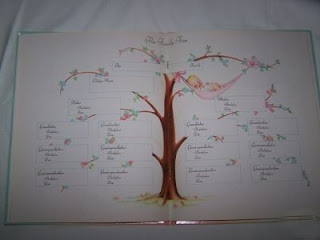 We had one of these in the kitchen for a short while. 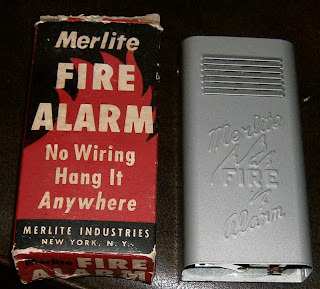 It didn't detect smoke, but rather heat and I remember Dad testing it by holding a match up to it. I think he decided that it didn't work well enough so he took it down. Basically the house would have to be engulfed in flames before it would go off. The alarm was quite loud though, a buzzer that would wake the dead. 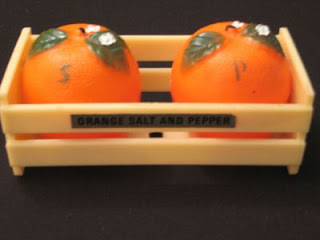 Mom had a huge collection of salt & pepper sets and this was one set she owned. It was never used, just kept on the shelves with the rest.